Sid Meier's Civilization Revolution was created specifically for consoles, though the game belongs to one of the most popular strategy game franchises aimed at PC players. Sid Meier's Civilization Revolution for X360, PS3 and etc. is another installment belonging to a very popular franchise that debuted in 1991; the original game was developed by MicroProse. Similar to the previous installments in the Civilization series, the game is a turn-based strategy utilizing certain classic patterns and placing a special emphasis on depicting particular civilizations rising and developing throughout centuries. Revolution was again created by Firaxis Games, which is a development team gathered in 1996 by Sid Meier and Jeff Briggs. The company is popular for creating such strategy games as Sid Meier's Railroads! or Alpha Centauri. What distinguishes Revolution from other installments however, is the fact that the game was created exclusively for those owning the most popular consoles, including PlayStation 3, Xbox 360, Nintendo DS and Wii. Fundamentals of the mechanics developed within the franchise remain unchanged in Revolution. To begin with, the player chooses from among sixteen civilizations available – each of them was assigned to a particular historical leader, such as Napoleon or Cleopatra. The player's most basic goals here are both to explore and expand. Many important issues have to be taken care of here – establishing new towns, ensuring their development or creating trade routes. What is also significant, is diplomacy, as well as taking military actions against other civilizations. Similar to the original game, the player will find here several different ways of achieving the ultimate victory. It can be done through military conquest, but also through gaining a sufficient number of points for economic or cultural growth; on top of that, the well-recognized race to build a spaceship in order to start conquering space is also an option. 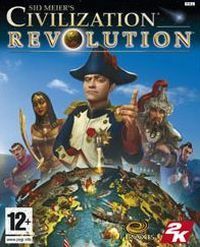 In Sid Meier's Civilization Revolution for X360, PS3 and etc., the player is also required to ensure proper technological development of their civilization in order to unlock new political systems, buildings, wonders or units. Armies the player leads were described in detail. A well-known system of gaining experience by going through subsequent encounters was implemented here as well. The player can buy very useful upgrades, such as a bonus that increases efficiency when attacking towns, or unique units. In terms of the visuals, the game differs a bit from its predecessors, offering bigger unit icons. What is also worth noticing, is that animations of units taking part in skirmishes are very detailed. Controls obviously match capabilities of particular consoles. The creators did not forget about those who search for a multiplayer experience, for the game offers such modes as Free for All or 1-on-1 Duel.